Helping girls write their way to more positive futures. 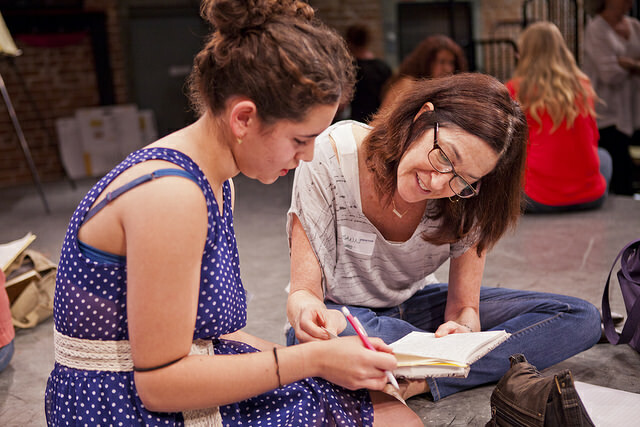 WriteGirl Mentors are invested in their teen's future and help with college applications and scholarship processes. Jane Anderson is an Emmy award-winning screenwriter, playwright and director. Aside from her success as writer for HBO's Olive Kitteridge, Jane's films have appeared on both large and small screens and her plays have been produced off-Broadway and in theaters around the country. Clare Sera has been in movies (The Princess Diaries), she’s written movies (Blended), but her favorite thing is serving as mentor, volunteer and general class clown for WriteGirl, which she has done since the very first day. Liz Meriwether is a screenwriter, producer and playwright. She is best known as the creator of Fox’s New Girl and for her work on 2011 rom-com, No Strings Attached. Josann McGibbon is a TV screenwriter/producer whose credits include Runaway Bride, The Starter Wife, which she co-created, and the Disney Channel movie Descendants. Michelle Lewis is a singer and songwriter who has written for top artists, including Cher, Amy Grant, Demi Lovato and Kelly Osbourne. Her work appeared in Cinderella, One Tree Hill and Felicity, among other films and TV series. Abby Anderson is a screenwriter who has placed in the semi-finals of the Nicholl Fellowship. She was also a Writer-in-Residence at Hedgebrook in 2009. Her mentee Jessica - now 21! - is in her 3rd year at Cal State Fullerton, majoring in Screenwriting. Vicky Deger, originally from Australia, lives in Los Angeles where she works, runs, writes, surfs, and contemplates the vast expense of tattoo removal. Her short life-based stories have appeared in The Coachella Review, The Grove Review, Gulf Stream Magazine and Ducts. Diahann Reyes is a nonfiction writer, a blogger, and an actor. She is working on a memoir. Before becoming an artist, she was a CNN writer/producer, a public relations account manager, and the first executive editor of FindLaw. Visit www.DiahannReyes.com. Retta Putignano is this volunteer. Retta has been with WriteGirl for over eight years, and the size and strength of her commitment have only gotten greater in that time. Retta’s mentored two WriteGirl teens through our program and on to college, and she is currently mentoring her third teen. They try to meet weekly—teen girls are very busy!—and write together. "Aside from being charming, supportive, and kind, one of my favorite things about Retta and having had her as my mentor is the way she could make me laugh. Spending hours over coffee and our notebooks cackling like hyenas together, and coming up with new ideas amidst the cookie crumbs and mayhem. She is someone who I will always look up to, as well as love, and has inspired me in a way that helped make me the person I am today, for which I will always be grateful." Retta also volunteers on the Events Team, planning fundraisers and special events—venues, food, guests… and silent auctions. Retta leads a team of silent auction fairies who generate miraculous donations, set up enticing displays and run flawless auctions. WriteGirl is lucky to have Retta’s skills, her dedication, her leadership. She honors WriteGirl with her steadfast commitment, even as we honor her.